Bhaktivinod Thakur showed how one could be so responsible and so highly respected in society and simultaneously be a perfect servant of God and humanity. He was a district magistrate. He was a judge under the British government, which was incredibly demanding. It is explained that Bhaktivinod Thakur, he was such an expert magistrate that he would try 30 to 50 cases every single day; what took every other magistrate in India half hour to do, he would do in five minutes. Because he had such a crystal clear consciousness, within minutes he could know who is guilty and who is innocent, and what their punishment or what their reward should be. It is explained that they would not even allow him to retire; he was so valuable. The British government, when he was living in Navadwip Dham, they built a railway track from the court house to his house, just to facilitate him getting there on time. That’s how valuable he was to them. It is explained that he would get home from work around 7 p.m.: he would take little Prasad, he would do some preaching. He would take rest about 8 p.m. or 9 p.m. By 10 or 11 he would be awake. 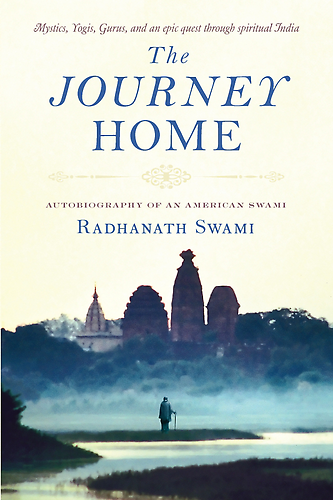 Every night he would spend 6 hours in writing books about Vaishnava philosophy. As a Grihastha he wrote over 100 books in various languages himself, describing the teaching of Bhagavad Gita, Srimad Bhagvatam and the life of Lord Chaitanya. Then he would take little Prasad, spend little time with his family. By 9.45 a.m., when he was living in Jagannathpuri – at one time he was magistrate there – he would take his carriage to the court house, and be there promptly by ten. He would try cases from 10 until 1. He would come home, take little rest, take little prasad. He would be back by 2 and from 2 to about 6, he would again resume his job as a judge. This was his life. Every moment… he was the most responsible person in society that anyone could be. 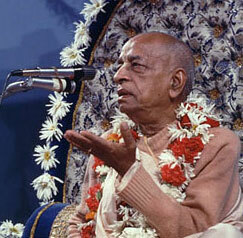 But when he was not doing his service for the government, every single second was for Krishna. Throughout the land he was famous as a person who never ever wasted a moment. He was either preaching, writing books about Krishna consciousness, reading the shastras, chanting the holy names, or counseling others. He had ten children. They were fully nourished – physically, mentally, and spiritually. Each one of his ten children was an exalted devotee of the Lord. His wife Bhagvati Devi Dasi was thoroughly in the same mood as him. She raised those ten children with such love and devotion, in such a way that they all became great devotees of God. She was always there to assist her husband, and all of his preaching, and everything he wanted to do. One of those ten children that he raised was Srila Bhaktisiddhanta Saraswati Thakur who is my param guru. And he used to extol the glories of his father as if he had a thousand mouths. In fact, before Bhaktisiddhanta was born, Bhaktivinod seeing the distressful condition of people in society, he prayed to God, “Please send one of your eternal associates as my child, to deliver the teachings of Bhagavad Gita to the world.” In an answer to his prayer this great Nityasiddha Paramhamsa acharya was born to him. 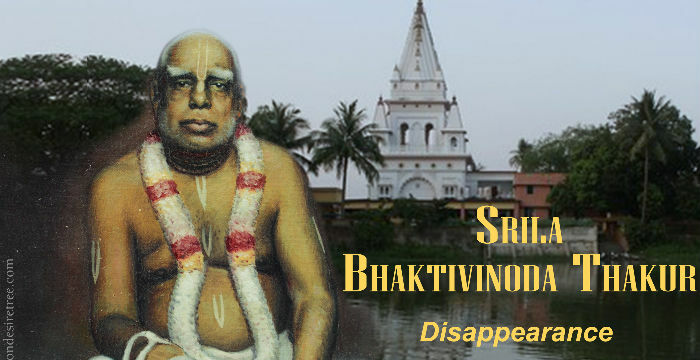 Besides being a magistrate – working from 10 to 1, 1 to 6, spending 6 hours a day writing Vaishnava literature, spending 2 ½ hours a day chanting the holy names, doing correspondence and preaching hours and hours a day – he was also the superintendent of the Jagannath temple. The British government saw nobody but him who could do the job nicely. It is explained that at that time, the offerings for Jagannath – everything was dirty, everything was disorganized. And he went in there, and he made it the most prompt and the most efficient temple in all of India. He performed all these duties and still raised ten children perfectly and provided for them everything they needed. In this way Bhaktivinod Thakur has taught that the example given by Lord Caitanya is not something that is out of anyone’s reach. It is practical. The translation is, “Whenever I come home I see the very house that I live transformed into Golok Vrindavan, the spiritual world. Golok Vrindavan appears in my home whenever I see the worship and service of Lord Hari going on there.” Bhaktivinod Thakur explains that this is the greatest joy.